Last weekend our Read North East team headed to Newcastle to host a book giveaway at the Get North Family Expo. With the support of Newcastle and Gateshead Library Services, 2,000 free books were handed out to families visiting the Get North event, which took place at St. James’ Park stadium on 4 and 5 August as part of the Great Exhibition of the North. Visitors could choose from a wide selection of titles suitable for primary school aged children, all kindly donated by campaign partner Penguin Random House. Read North East is a campaign from the North East Literacy Forum, led by the National Literacy Trust, which aims to raise literacy levels across the region. As well as giving out books for children to take home and enjoy, the giveaway was an opportunity to promote the importance of reading to parents. 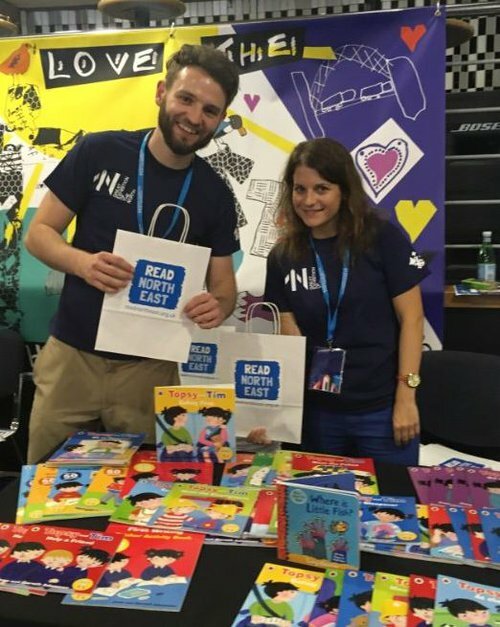 "We were thrilled to bring Read North East to this year's Get North Family Expo and put more books into the hands of local children who may not have any at home. We know that enjoying reading has an important impact on how well children do at school - we hope the event has encouraged families to spend more time reading together which will inspire children to fall in love with the world of stories."